The multi-faceted controversy over Donald Trump’s taxes has been rejuvenated by a partial leak of his 2005 tax return. Interestingly, it appears that Trump pays a lot of tax. At least for that one year. Which is contrary to what a lot of people have suspected – including me in the column I wrote on this topic last year for Time. 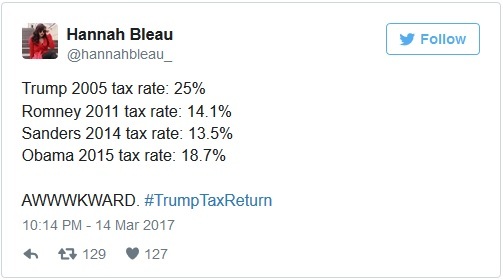 Some Trump supporters are even highlighting the fact that Trump’s effective tax rate that year was higher than what’s been paid by other political figures in more recent years. But I’m not impressed. First, we have no idea what Trump’s tax rate was in other years. So the people defending Trump on that basis may wind up with egg on their face if tax returns from other years ever get published. Second, why is it a good thing that Trump paid so much tax? I realize I’m a curmudgeonly libertarian, but I was one of the people who applauded Trump for saying that he does everything possible to minimize the amount of money he turns over to the IRS. As far as I’m concerned, he failed in 2005. But let’s set politics aside and focus on the fact that Trump coughed up $38 million to the IRS in 2005. If that’s representative of what he pays every year (and I realize that’s a big “if”), my main thought is that he should move to Italy. Yes, I realize that sounds crazy given Italy’s awful fiscal system and grim outlook. But there’s actually a new special tax regime to lure wealthy foreigners. Regardless of their income, rich people who move to Italy from other nations can pay a flat amount of €100,000 every year. Note that we’re talking about a flat amount, not a flat rate. Here’s how the reform was characterized by an Asian news outlet. Italy on Wednesday (Mar 8) introduced a flat tax for wealthy foreigners in a bid to compete with similar incentives offered in Britain and Spain, which have successfully attracted a slew of rich footballers and entertainers. The new flat rate tax of €100,000 (US$105,000) a year will apply to all worldwide income for foreigners who declare Italy to be their residency for tax purposes. Here’s how Bloomberg/BNA described the new initiative. Italy unveiled a plan to allow the ultra-wealthy willing to take up residency in the country to pay an annual “flat tax” of 100,000 euros ($105,000) regardless of their level of income. A former Italian tax official told Bloomberg BNA the initiative is an attempt to entice high-net-worth individuals based in the U.K. to set up residency in Italy… Individuals paying the flat tax can add family members for an additional 25,000 euros ($26,250) each. The local media speculated that the measure would attract at least 1,000 high-income individuals. Think about this from Donald Trump’s perspective. Would he rather pay $38 million to the ghouls at the IRS, or would he rather make an annual payment of €100,000 (plus another €50,000 for his wife and youngest son) to the Agenzia Entrate? Seems like a no-brainer to me, especially since Italy is one of the most beautiful nations in the world. Like France, it’s not a place where it’s easy to become rich, but it’s a great place to live if you already have money. But if Trump prefers cold rain over Mediterranean sunshine, he could also pick the Isle of Man for his new home. There are no capital gains, inheritance tax or stamp duty, and personal income tax has a 10% standard rate and 20% higher rate. In addition there is a tax cap on total income payable of £125,000 per person, which has encouraged a steady flow of wealthy individuals and families to settle on the Island. Though there are other options, as David Schrieberg explained for Forbes. Italy is not exactly breaking new ground here. Various countries including Portugal, Malta, Cyprus and Ireland have been chasing high net worth individuals with various incentives. In 2014, some 60% of Swiss voters rejected a Socialist Party bid to end a 152-year-old tax break through which an estimated 5,600 wealthy foreigners pay a single lump sum similar to the new Italian regime. Though all of these options are inferior to Monaco, where rich people (and everyone else) don’t pay any income tax. Same with the Cayman Islands and Bermuda. And don’t forget Vanuatu. If you think all of this sounds too good to be true, you’re right. At least for Donald Trump and other Americans. The United States has a very onerous worldwide tax system based on citizenship. In other words, unlike folks in the rest of the world, Americans have to give up their passports in order to benefit from these attractive options. And the IRS insists that such people pay a Soviet-style exit tax on their way out the door. During the campaign the NY Times released part of his 1995 tax return and said he could avoid paying taxes for twenty years. Obviously he used up the tax loss carry forward in less than 10 years. I’m less concerned about how much Trump (or any other public figure) paid in taxes than I am about the IRS sieve. Silly me, I thought that releasing a person’s tax returns without the person’s consent was a crime, but we’re constantly reminded that laws are for the little people, so Rachel Maddow and the IRS leakers won’t be facing any charges, right? “If you think all of this sounds too good to be true, you’re right. At least for Donald Trump and other Americans. The United States has a very onerous worldwide tax system based on citizenship. “Exit tax”? The can sit on and exit this!